"Incentives are one of the fastest emerging asset classes... and the world is taking notice." By utilizing big data and predictive analytics and machine learning and data visualization, tax departments now have the opportunity to greatly expand their ability to deliver forward-looking insights to an entire organization. 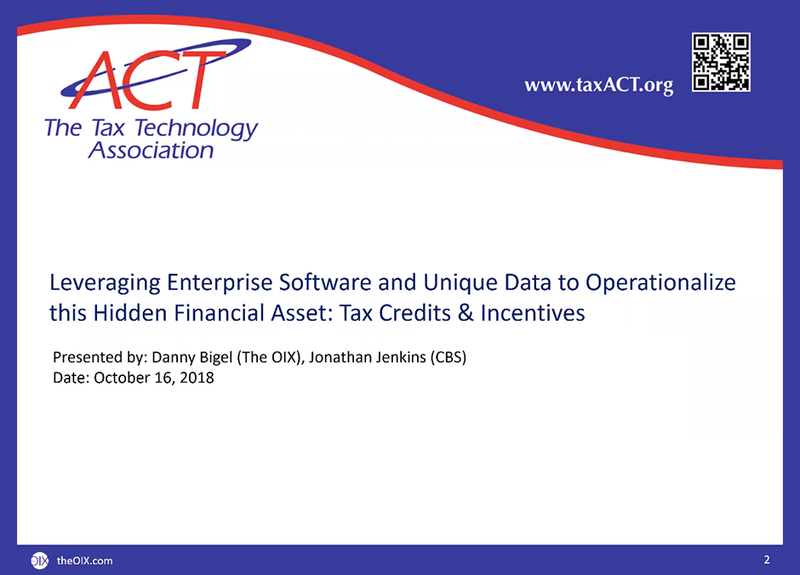 Join OIX founder (Danny Bigel) and CTO (Nick Namikas) in a discussion about why now is the time for tax departments to create a tax analytics roadmap by leveraging existing technology. Discover how these solutions will drive a significant increase in enterprise value by turning tax credit & incentive portfolios into strategic assets. Danny Bigel, Founder & Chief Strategy Officer of The OIX, participated on a panel to discuss best practices for tracking, managing and reporting on all forms of government assistance for businesses (public and private) of all sizes. 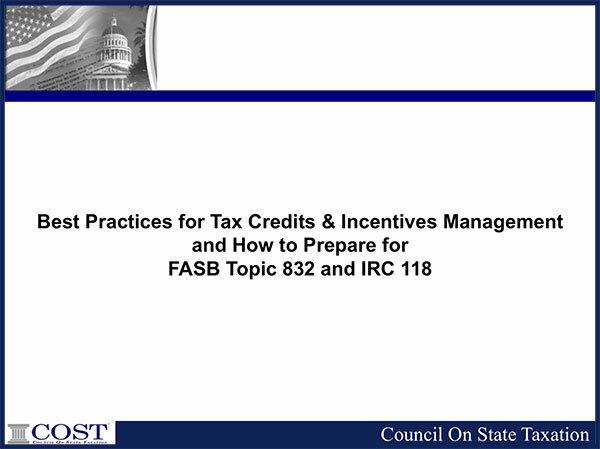 Not only is it critical to gain better control and visibility of this important asset, but to also prepare for new and pending regulations – FASB Topic 832 and IRC 118– which will require greater disclosures on: tax credits, incentives, grants, abatements, rebates, bond guarantees, refundable tax credits, statutory/negotiated incentives, etc. 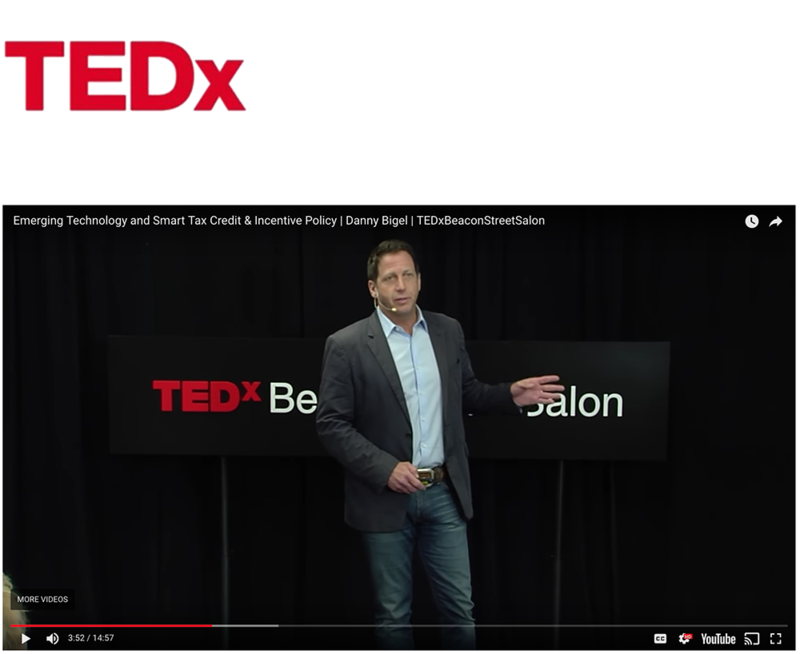 Danny Bigel, Founder & Chief Strategy Officer of The OIX, presented at TEDxBeaconStreet. Today, business (of all sizes) has successfully leveraged the inter-connectivity of information technology to build global infrastructures with unprecedented power and productivity while government has been left in the wake. But fear not; government has the tools at its disposal to combine the most effective economic development policy tools know as tax credits & incentives along with emerging technologies to regain global economic power. 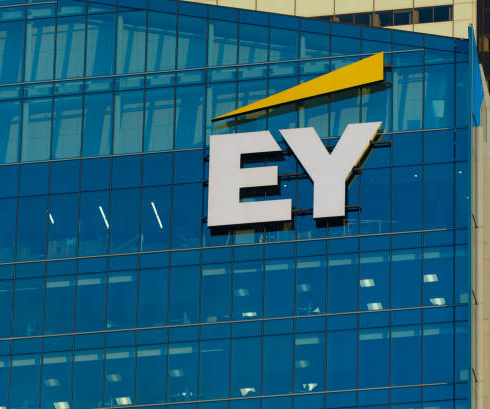 The EY FinTech Pitch Day is part of an overall Global Tax Innovation strategy to further the next generation of tax services as part of a systematic approach to address the many forces affecting clients’ functions. Under the guidance of Jeff Saviano, EY Global Tax Innovation Leader and Americas Tax Innovation, Solutions & Technology Leader, EY Tax teams discover, design and commercialize new tax services, with an emphasis on deployment of new technology platforms. Below are archived news articles and events pertaining to OIX’s legacy business as the first online marketplace for state transferable credits. In Q1 2018 The OIX pivoted to an enterprise technology provider for all stakeholders who touch on tax credits & incentives offering management, advisory and transactional tools to business and government. STARTUP LAUNCHES FIRST ONLINE TAX CREDIT EXCHANGE.